In the past decade, Alpina has specialized in the conception of sporty watches. Consequently their watches often find themselves in pretty amazing situations. Whether it be skiing on the peaks of the Alps or diving under the infamous waters of the Bikini Atoll, Alpina watches are suited for many challenges. Last year Alpina embarked on a cooperation between themselves and Sebring International Raceway, where the watch manufacturer was named Official timekeeper. The collaboration is continued this year and a new limited edition chronograph will not only serve to seal the deal, but to commemorate the 58th anniversary of the American Le Mans Series’ 12 Hours of Sebring Circuit. The new 158-piece limited edition model will be shown next month at the 2010 Baselworld fair and is aptly named 12 Hours of Sebring Automatic Chrono GMT. The timepiece runs on the automatic AL-750 chronograph movement and is equipped with the ability to calculate a second timezone on a 24 hour dial. Both chronograph and GMT functions have special meaning in the race world. The GMT represents the International nature of the race, while the chronograph is indispensable when measuring performance! The dial is pretty standard with 12-hour and 30-minute chronograph registers. The 12 hour-register is perfect for measuring the Sebring race, and this coincidence is marked by a red twelve, which represents the race’s end. Clear hour markings and red accents evoke visions of a sleek, sporty exotic car dashboard. 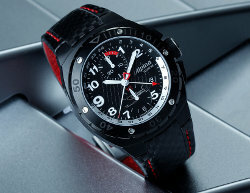 The strap continues this theme nicely with carbon fiber-like pattern and red stitching. The supple, grained leather of the strap is also red and is hand stitched like the luxurious bucket seats of a Ferrari. The 47mm case is considerable in size, but thanks to the specialized shape of the lugs and relatively low-profile, it fits comfortably on the wrist. The screw-locking crown, with rubber-clad grip fits well between the streamlined pushers. The black PVD coating and black luminous markings on the bezel are stealthy and cool. The back of the case offers a view of the automatic movement and engraved rotor. Overall, the case is aerodynamic and modern without unnecessary intricacy. The new Alpina 12 Hours of Sebring Automatic Chrono GMT is a finely tuned homage to the world of motor racing. Luxury, performance, comfort, and style captured in this watch as they would be in any luxury exotic sport car. Marco is a specialist of Alpina watches at Matt Baily.